By now I'm convinced I need to go visit Egypt, and soon! After reading the ad, I wanted to check and see if the tour operator, Adventure Center, had a web site. I went to http://www.adventurecenter.com and sure enough it was the tour operator's site. I clicked on the About Us link first. I was excited to see they had been running small tours, to destinations around the world, for 24 years. I began to feel much more comfortable about giving them my money. Still hungry for information, I clicked on the site's FAQ link. I cruised through about 20 questions and answers, and decided the next step would be to call and find out about the availability of my trip. After work, I called Adventure Center. The woman who answered had a strong English accent. Adventure Center was located in California, so this raised my curiosity. I mentioned the specific trip that interested me, as well as where I saw the ad for it. I commented on the fact that there seemed to be a trip leaving every week of the year. She replied that while that is true, they tend to fill up quickly. After mentioning the time period I was interested in traveling (October/November 2001), she ran through the dates that were available. We went to Adventure Center's web site together, and she pointed out additional information was available for the trip. I clicked on the View Dossier link on the left hand side of the page, and Adobe Acrobat opened to show a more detailed itinerary. I asked the woman if she had ever taken a trip through her company, to which she replied “yes.” We spoke briefly about what the experience is like. She mentioned that most of the people on the tour groups are English, as it was an English company. There were however some Canadian and Americans as well. For some reason, I found the idea of taking a trip through them even more appealing. Not that I have anything against us American travelers, but sometimes we can be a bit obnoxious and less interesting than our foreign counterparts. I asked about the general age range for the travelers that choose this trip. She said they tend to be of varying ages, but on the younger side since you will have to sleep on the deck of the sailboat for part of the trip. 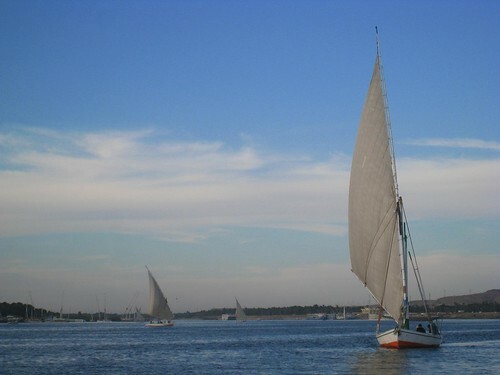 The thought of sailing down the Nile, asleep on the deck of a sailboat, under the Egyptian sky, quickly filled my mind. I was about out of questions, so I told her I would call back when I was ready to book my trip. 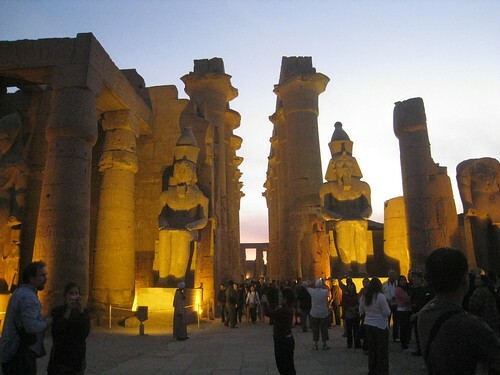 My wife would love to visit Egypt and these pictures make it all the more inviting. Thanks. You’re welcome – Egypt is certainly unlike any other country I’ve experienced. It feels like some traditions haven’t changed for centuries.